July 20st, 2019, will mark the 50th anniversary of the historic Moon Landing, where astronauts Neil Armstrong and Buzz Aldrin set foot on the lunar surface for the first time. This accomplishment was the high point of the “Space Race” and has remained NASA’s crowning achievement in space. In the coming years, NASA will attempt to return to the Moon, where they will be joined by several other space agencies. To prepare for these eventual missions, a group of cosmonauts recently commenced an isolation experiment that will simulate a long-term mission to the Moon. It’s called the SIRIUS-19 experiment, which began earlier today at 02:00 p.m. local time (04:00 a.m. PDT; 07:00 a.m. EDT) at the Russian Academy of Sciences’ Institute of Biomedical Problems (IBMP) in Moscow. NASA managers have just made the difficult but unavoidable decision to scrub the planned March 2016 launch of the InSight lander, the agency’s next mission to Mars, by at least two years because of a vacuum leak that was just detected in the probes flawed seismometer instrument which cannot be fixed in time. Scene from ‘The Martian’ starring Matt Damon as NASA astronaut Mark Watney contemplating magnificent panoramic vista while stranded alone on Mars. Go now and experience Hollywood’s blockbuster new space epic ‘The Martian’ helmed by world renowned director Ridley Scott and starring Matt Damon as the protagonist, NASA astronaut Mark Watney. And you can follow Watney’s dramatic fictional path across the Red Planet in newly released real photos and a flyover video of the region, from DLR and NASA, as it looks today. ‘The Martian’ is a mesmerizingly enjoyable cinematic triumph for everyone that’s all about science, space exploration and one man’s struggle to survive while left totally isolated on the Red Planet in the face of seemingly insurmountable odds – relying on his wits alone to endure “on a planet where nothing grows” while hoping somehow for a rescue by NASA four years in the future. The movie combines compelling and plausible storytelling with outstanding special effects that’s clearly delighting huge audiences worldwide with a positive and uplifting view of what could be achieved in the future – if only we really put our minds to it! Based on the bestselling book by Andy Weir, ‘The Martian’ movie from 20th Century Fox tells the spellbinding story of how NASA astronaut Mark Watney is accidentally stranded on the surface of Mars during the future Ares 3 manned expedition in 2035, after a sudden and unexpectedly fierce dust storm forces the rest of the six person crew – commanded by Jessica Chastain as Commander Lewis – to quickly evacuate after they believe he is dead. Now you can follow the fictional exploits of Mark Watney’s stunningly beautiful trail across the real Mars through a set of newly released maps, imagery and a 3D video created by the DLR, the German Aerospace Agency, and NASA – and based on photos taken by the European Space Agency’s Mars Express orbiter and NASA’s Mars Reconnaissance Orbiter (MRO). DLR’s stunning 3D overflight video sequence was created from a dataset of 7300 stereo images covering roughly two-and-a-half million square kilometres of precisely mapped Martian landscape captured over the past 12 years by Mars Express High Resolution Stereo Camera (HRSC). The electric score is by Stephan Elgner. Ridley Scotts ‘The Martian’ takes place mostly on the surface of the Red Planet and is chock full of breathtakingly beautiful panoramic vistas. In the book you can only imagine Mars. In the movie Scott’s talents shine as he immerses you in all the action on the alien world of Mars from the opening scene. Starting with the landing site for Watney’s Ares 3 mission crew at Acidalia Planitia, the book and movie follows his triumphs and tribulations, failures and successes as he logically solves one challenging problem after another – only to face increasingly daunting and unexpected hurdles as time goes by and supplies run low. The DLR route map shows a real topographic view of Watney’s initial journey back and forth from the fictional Ares 3 landing site to the actual landing site of NASA’s 1997 Mars Pathfinder lander and Sojourner rover mission at the mouth of Ares Vallis. The map continues with Watney’s months-long epic trek to the fictional landing site of Ares 4 Mars Ascent Vehicle (MAV) spacecraft at Schiaparelli Crater, by way of Marth Valles and other Martian landmarks, craters and valleys. At the request of Andy Weir, the HiRISE camera on NASA’s MRO orbiter took photos of the Martian plain at the Ares 3 landing site in Acidalia Planitia, which is within driving distance from the Pathfinder lander and Sojourner rover in the book and movie. The Martian is all about how Watney uses his botany, chemistry and engineering skills to “Science the sh** out of it” to grow food and survive until the hoped for NASA rescue. Learning how to live off the land will be a key hurdle towards enabling NASA’s real strategy for long term space voyages on a ‘Journey to Mars’ and back. ‘The Martian’ is a must see movie that broadly appeals to space enthusiasts and general audiences alike who can easily identify with Watney’s ingenuity and will to live. Since its worldwide premiere on Oct. 2, ‘The Martian’ has skyrocketed to the top of the US box office for the second weekend in a row, hauling in some $37.3 million. The total domestic box office receipts now top $108 million and rockets to over $228 million worldwide in the first 10 days alone. I absolutely loved ‘The Martian’ when I first saw the movie on opening weekend. And enjoyed it even more the second time, when I could pick up a few details I missed the first time around. The movie begins as the crew evacuates after they believe Watney was killed by the dust storm. Watney actually survived the storm but lost contact with NASA. The film recounts his ingenious years long struggle to survive, figure out how to tell NASA he is alive and send a rescue crew before he starves to death on a planet where nothing grows. Watney’s predicament is a survival lesson to all including NASA. The movie closely follows the book, which I highly recommend you read at some point. By necessity, the 2 hour 20 minute movie cannot capture every event in the book. So there is an abbreviated sense of Watney’s detailed science to survive and lengthy overland trips. All the heroics and difficulties in traveling to Pathfinder and back and getting communications started, as well as the final month’s long journey to Schiaparelli crater are significantly condensed, but captured in spirit. The Martian is brilliant and intelligent and rivals Stanley Kubrik’s space epic ‘2001: A Space Odyssey’ as one of the top movies about humanities space exploration quest. The one big science inaccuracy takes place right at the start with the violent Martian dust storm. On Mars the atmosphere is so thin that the winds would not be anywhere near as powerful or destructive as portrayed. This is acknowledged by Weir and done for dramatic license. We can look past that since the remainder of the tale portrays a rather realistic architectural path to Mars and vision of how scientists and engineers think. Plus the dust storms can in fact kick up tremendous amounts of particles that significantly block sunlight from impinging on solar energy generating panels. Personally I can’t wait for the ‘Directors Cut’ with an added 30 to 60 minutes of scenes that were clearly filmed – but not included in the original theatrical release. “Mars generates immense fascination, and our curiosity continues to grow! Many people are interested in our research, and young people in particular want to know what it is really like up there, and how realistic the idea that one day people will leave their footprints on the surface of Mars truly is. The data acquired by HRSC shows Mars with a clarity and detail unmatched by any other experiment. Only images acquired directly on the surface, for instance by rovers like Curiosity, are even closer to reality, but they can only show a small part of the planet. Thanks to this animation, we have even noticed a few new details that we had not seen in a larger spatial context. That is why we made the film – it helps everyone see what it would be like for Watney to travel through these areas… the clouds were the only creative touches we added, because, fortunately, they do not appear in the HRSC data,” according to a DLR statement. As a scientist and just plain Earthling, my most fervent hope is that ‘The Martian’ will inspire our young people to get interested in all fields of science, math and engineering and get motivated to become the next generation of explorers – here on Earth and beyond to the High Frontier to benefit all Mankind. 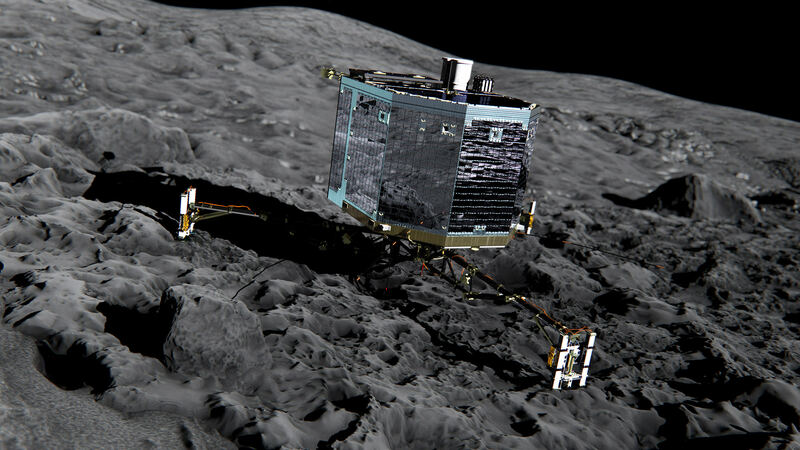 The ‘Top 5’ landing site candidates have been chosen for the Rosetta orbiters piggybacked Philae lander for humankind’s first attempt to land on a comet. See graphics above and below. 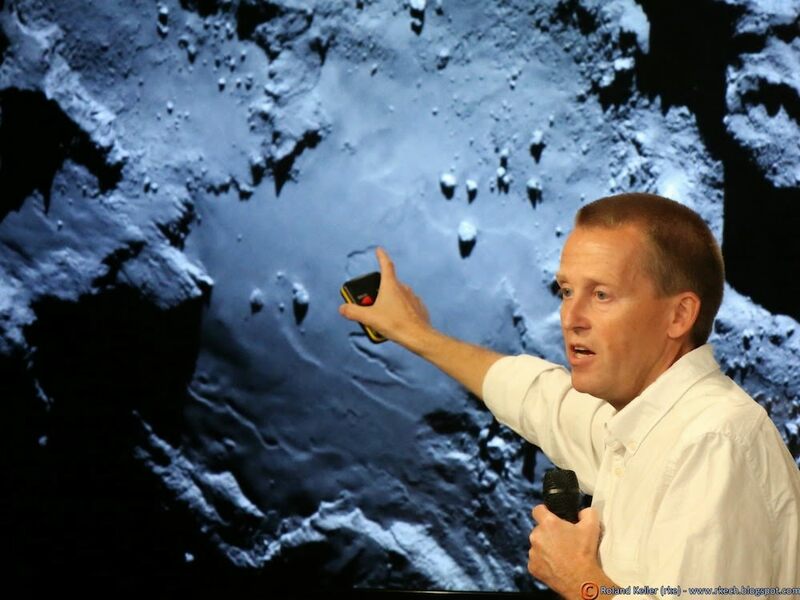 The potential touchdown sites were announce today, Aug. 25, based on high resolution measurements collected by ESA’s Rosetta spacecraft over the past two weeks since arriving at the bizarre and pockmarked Comet 67P/Churyumov-Gerasimenko on Aug. 6, 2014. “The challenge ahead is to map the surface and find a landing strip,” said Andrea Accomazzo, ESA Rosetta Spacecraft Operations Manager, at the Aug. 6 ESA arrival live webcast. So ‘the clock is ticking’ to select a suitable landing zone soon as the comet warms up and the surface becomes ever more active as it swings in closer to the sun and makes the landing ever more hazardous. Their goal was to find a ‘technically feasible’ touchdown site that was both safe and scientifically interesting. “The site must balance the technical needs of the orbiter and lander during all phases of the separation, descent, and landing, and during operations on the surface with the scientific requirements of the 10 instruments on board Philae,” said ESA. They also had to be within an ellipse of at least 1 square kilometer (six-tenths of a square mile) in diameter due to uncertainties in navigation as well as many other factors. “For each possible zone, important questions must be asked: Will the lander be able to maintain regular communications with Rosetta? How common are surface hazards such as large boulders, deep crevasses or steep slopes? Is there sufficient illumination for scientific operations and enough sunlight to recharge the lander’s batteries beyond its initial 64-hour lifetime, while not so much as to cause overheating?” according to ESA. The Landing Site Selection Group (LSSG) team was comprised of engineers and scientists from Philae’s Science, Operations and Navigation Centre (SONC) at CNES, the Lander Control Centre (LCC) at DLR, scientists representing the Philae Lander instruments as well as the ESA Rosetta team, which includes representatives from science, operations and flight dynamics. “Based on the particular shape and the global topography of Comet 67P/ Churyumov-Gerasimenko, it is probably no surprise that many locations had to be ruled out,” said Ulamec. When Rosetta arrived on Aug. 6, it was initially orbiting at a distance of about 100 km (62 miles) in front of the comet. Carefully timed thruster firings then brought it to within about 80 km distance. And it is moving far closer – to within 50 kilometers (31 miles) and even closer! Upon arrival the comet was 522 million km from the Sun. 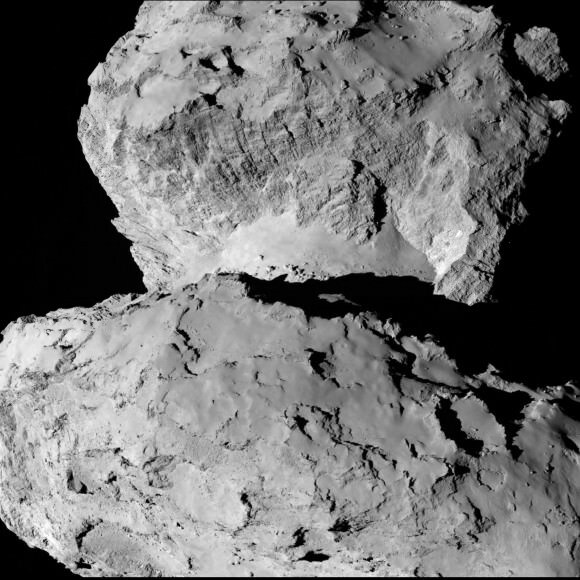 As Rosetta escorts the comet looping around the sun, they move much closer. By landing time in mid-November they are only about 450 million km (280 million mi) from the sun. At closest approach on 13 August 2015 the comet and Rosetta will be 185 million km from the Sun. That corresponds to an eightfold increase in the light received from the Sun. Therefore Rosetta and Philae will simultaneously study the warming effects of the sun as the comet outgases dust, water and much more. 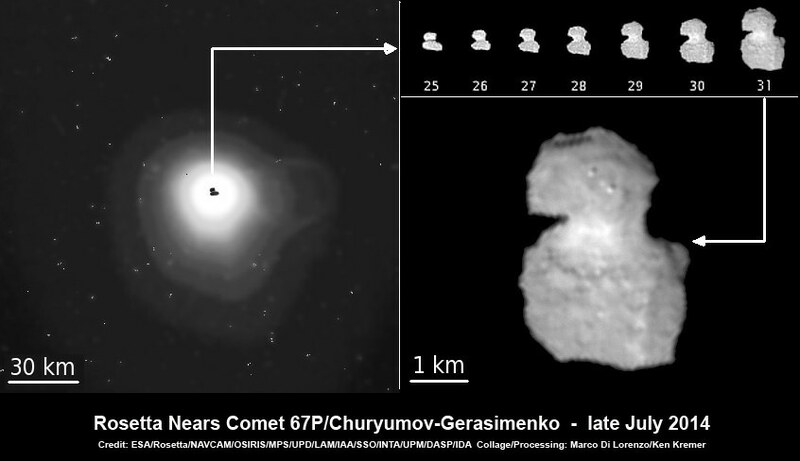 The short period Comet 67P/Churyumov-Gerasimenko has an orbital period of 6.5 years. The ‘Top 5’ zones will be ranked by 14 September. Three are on the ‘head’ and two are on the ‘body’ of the bizarre two lobed alien world. And a backup landing site will also be chosen for planning purposes and to develop landing sequences. The ultimate selection of the primary landing site is slated for 14 October after consultation between ESA and the lander team on a “Go/No Go” decision. Take us into orbit Mr. Sulu! The Dawn science team has released two spectacular rotation movies of the entire globe of the giant asteroid Vesta. The flyover videos give the distinct impression that you are standing on the bridge of the Starship Enterprise and gazing at the view screen as the ship enters orbit about a new planet for the first time and are about to begin an exciting new journey of exploration and discovery of the body you’re looking at below. Thanks to NASA, DLR, ASI and Dawn’s international science and engineering team, we can all join the away team on the expedition to unveil Vesta’s alluring secrets. Click the start button and watch protoplanet Vesta’s striking surface moving beneath from the perspective of Dawn flying above – in the initial survey orbit at an altitude of 2700 kilometers (1700 miles). Vesta is the second most massive object in the main asteroid belt and Dawn’s first scientific conquest. Another video below was compiled from images taken earlier on July 24, 2011 from a higher altitude after Dawn first achieved orbit about Vesta and revealed that the northern and southern hemispheres are totally different. The array of images in the videos was snapped by Dawn’s framing camera which was provided by the German Aerospace Center (DLR). The team then created a shape model from the images, according to Dr. Carol Raymond, Dawn’s Deputy Principal Investigator from NASA’s Jet Propulsion Laboratory in Pasadena, Calif. The shape model will aid in studying Vesta’s strikingly diverse features of mountains, ridges, valley’s, scarps, cliffs, grooves, craters, even a ‘snowman’ and much more. Notice that not all of Vesta is illuminated – because it’s northern winter at the asteroid. Vesta has seasons like Earth and the northern polar region in now in perpetual darkness. Data is collected over the day side and radioed back to Earth over the night side. Another movie highlight is a thorough look at the gigantic south pole impact basin. The circular feature is several hundred miles wide and may have been created by a cosmic collision eons ago that excavated massive quantities of material and basically left Vesta lacking a south pole. The massive feature was discovered in images taken by the Hubble Space Telescope several years ago and mission scientists have been eager to study it up close in a way that’s only possible from orbit. Dawn’s three science instruments will investigate the south pole depression in detail by collecting high resolution images and spectra which may reveal the interior composition of Vesta. Dawn entered the survey orbit on Aug. 11 and completed seven revolutions of 69 hours each on Sept. 1. It transmitted more than 2,800 pictures from the DLR framing camera covering the entire illuminated surface and also collected over three million visible and infrared spectra from the VIR spectrometer – provided by ASI, the Italian Space Agency. This results exceeded the mission objectives. The Dawn spacecraft is now spiraling down closer using its ion propulsion system to the next mapping orbit – known as HAMO – four times closer than the survey orbit and only some 680 km (420 miles) above the surface.